William LeGette Blythe (1900-1993) was both a respected journalist and a prolific author of novels, biographies, and outdoor dramas based on the history of Charlotte and Mecklenburg County. Born in Huntersville, North Carolina, he graduated in 1921 from the University of North Carolina at Chapel Hill, where he was a member of the original Carolina Playmakers and a classmate of Thomas Wolfe, Paul Green, and Jonathan Daniels. 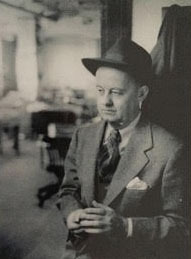 Blythe opted for a career in journalism, first with the Charlotte News and then, in 1927, with the Charlotte Observer. In 1950 he left the paper to write books full-time. Blythe twice won the Mayflower Cup for Nonfiction, first in 1953 for Miracle in the Hills, the story of Dr. Mary Martin Sloop’s crusade to improve the lives of mountain people, and again in 1961 for Thomas Wolfe and His Family. His death marked the passing of the last of an illustrious group of writers who helped launch the Southern literary renascence. Take a look inside William Henry Belk: Merchant of the South by William LeGette Blythe (UNC Press, 2011).